﻿﻿Painting our forests and canyons, maples provide many resources. ﻿﻿This time of year, Old Man Winter blows delightfully cool fronts down into Texas, and our native maples begin to brighten woodlands and forested landscapes with brilliant arrays of yellow, orange and red. There’s no more pleasant way to enjoy an autumn afternoon than to walk among these flaming trees, to feel the crisp air against your cheeks and to watch the slow-motion dance of a maple leaf’s tumble to the forest floor. Texas is blessed with a diversity of maple species. Some are well-known and are easy to observe by the road; others grow far off the beaten path, but are worthy of a day’s hike to discover. Maples flower in late winter and spring. The fruits are samaras (winged) and are spread by the wind. 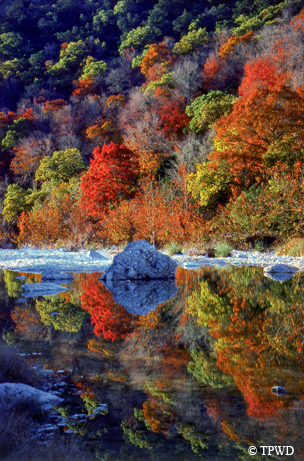 Depending on the species, maples range from 15 to 75 feet tall in Texas. The three most noticeable maples are red maple (Acer rubrum) and two types of sugar maple (Acer barbatum and A. saccharum), found in slope forests and bottomlands of eastern Texas. Sugar maples can be seen at Caddo Lake, Atlanta State Recreation Area and Sabine National Forest. White-tailed deer eat young red maple and sugar maple leaves. Squirrels and birds enjoy the fruits, and bees and butterflies visit the flowers. Sugar maples have many human uses: sugar and syrup, hardwood lumber, flooring, furniture, boxes and crates, even bowling pins. Lost Maples State Natural Area takes its name from an isolated population of bigtooth maples (Acer grandidentatum) that grow in shaded canyons of the Edwards Plateau. Other isolated but easily accessible populations of bigtooth maple can be found in the Chisos Mountains of Big Bend National Park and in Guadalupe Mountains National Park. Other Texas maple species are the box elder (Acer negundo), silver maple (Acer saccharinum) and chalk maple (Acer leucoderme). Box elder is the most abundant maple in Texas. It occurs in Central and North-Central Texas, through East Texas and along the midcoast’s creeks and rivers. It is used for low-quality furniture, interior finishing and barrels. Its sap is a source of food for birds and mammals. In Texas, silver maple is not well-known in natural settings. It occurs naturally in isolated populations on sand bars along East and Northeast Texas waterways. Turkeys, ducks, squirrels and other small mammals eat silver maple seeds. Silver maple has very soft wood with cavities, providing a home to birds, raccoons, opossums and bats. Chalk maple is also rarely observed. It occurs in deep East Texas in moist ravines, most notably the Sabine National Forest. Since there are few public trails in this national forest, a hike led by a local chapter of the Native Plant Society of Texas is one of the best options for seeing chalk maples. How do maple leaves change their color? Maple leaves obtain their green color from chlorophyll, a pigment found in the leaves that allows them to process sunlight. Autumn’s cooler temperatures and shorter days trigger the chlorophyll to move from the leaves to the branches, trunk and roots, so the orange and yellow pigments that are always present become more noticeable. On warmer fall days, sugar moves in the leaves of some trees and is trapped by the cooling of night. As sugar accumulates, the leaves turn brighter red. Take time this fall to enjoy a walk among these majestic maples that provide not only a lovely escape from our busy lives but also a bounty of resources for wildlife and raw materials for humans.